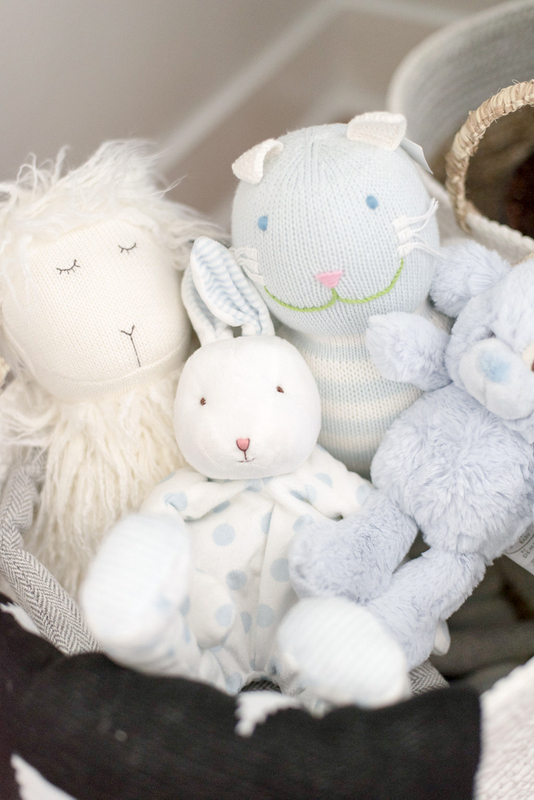 My vision for Watson’s nursery was something not too babyish, but still so very sweet and calming. I also thought I’d take advantage of the only time I’ll ever be able to have total control of his room decor! Figured I’d decorate with as many bunny stuffed animals and white fabrics as I can for now… because the footballs and toy trucks will arrive soon enough, I’m sure. 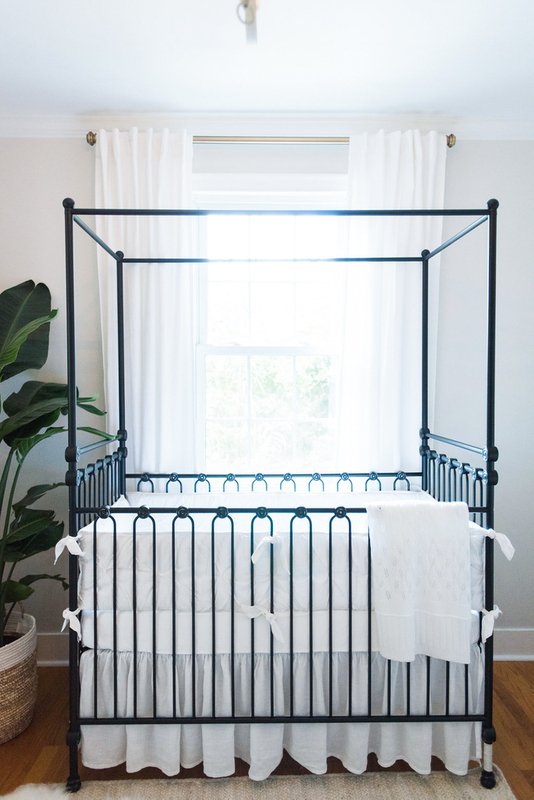 I started off with the Bratt Decor Joy Canopy Crib in distressed black cast iron as my inspiration piece. 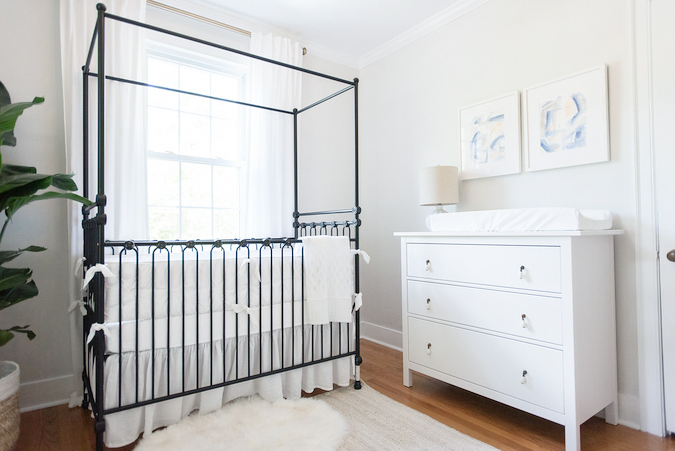 With such a visually strong crib, I knew I wanted the rest of the nursery to be simple with shades of white and grey in various textures like faux fur, seagrass, and linen. 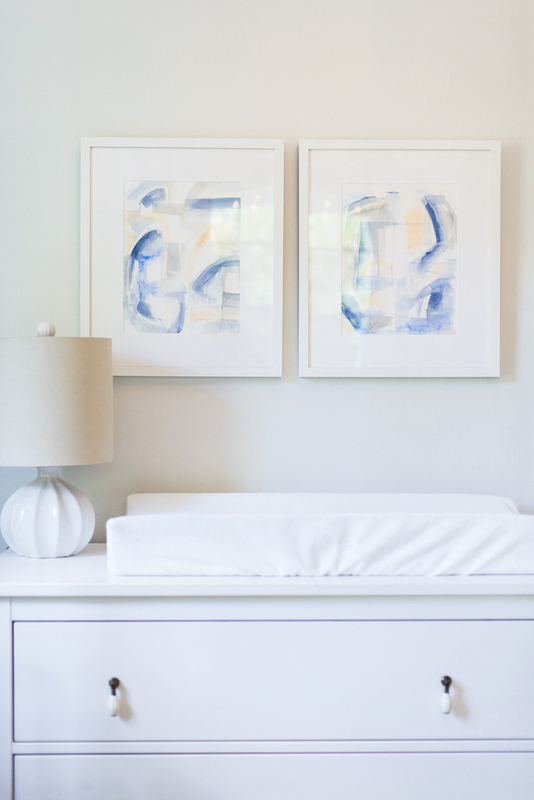 Way Way Allen, an artist local to Charleston, was so sweet to paint two pieces especially for his nursery, which we hung over the changing table. You may have noticed some of Way Way’s work at Serena & Lily. I’ve been a fan of her artwork for the longest time and was so excited to have two pieces in Watson’s room. Had them framed with Framebridge, which, for the record, is an awesome process from the service to the price. I think it’s the best way to go about framing. You can use code HOLYCITYCHIC to save 10% off your order, if you’d like. 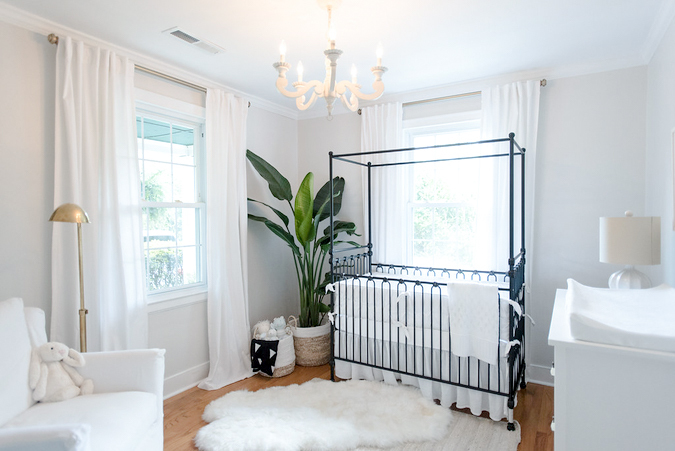 Two other things I knew I wanted for this nursery were a big Bird of Paradise plant for a pop of color and a big white glider with a washable slipcover, which I found at Celadon. That’s my home decor go-to store in Charleston—both their retail store in Mount Pleasant and their warehouse/outlet in North Charleston. Their buyers have a super eye for unique pieces and the classics, too. I just know what I find at Celadon isn’t going to be everywhere. Also got the bookshelf and that hand carved wooden fish from there, too. They’ve also got an online shop! And to sit next to that glider, I found this Robert Abbey Alvin Adjustable Pharmacy Floor Lamp at Lamps Plus. (They are another go-to for me.) The painting behind the light was done a long time ago by Brandon’s grandmother. We also added the Etienne Chandelier from RH Baby and Child. Hard to tell from the photos, but it’s wooden and I love it. These photos are by Marni Rothschild. She shot our wedding, so it meant a whole lot to have her catch this milestone, too. There’s a bunch more photos she took that I’d love to share with y’all one day soon. 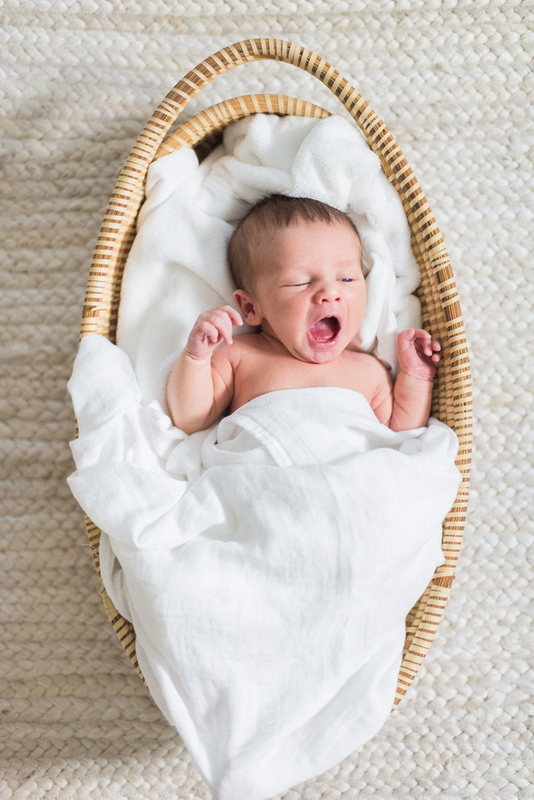 It’s funny looking at some of them because I can see in our eyes just how sleep deprived we are, but I kind of love that I can see that in the photos at the same time… because that is certainly our life right now! 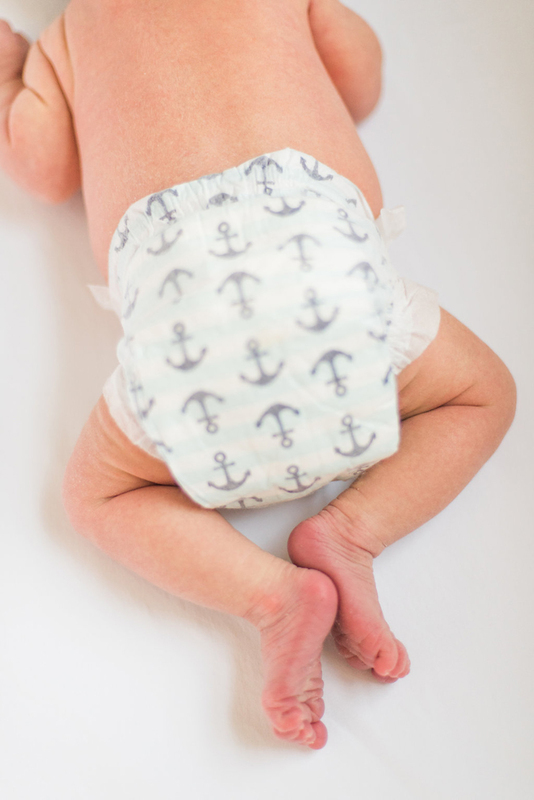 I’ve been soaking up every second I possibly can with our baby boy, but once I can get back into the regular blogging routine, I promise to share what I packed and used in my hospital bag, what’s in Watson’s closet, how I organized his dresser drawers, what I’ve been storing in my diaper bag, and first month must haves. I always love posts like that, so hopefully you will too! p.s. The winner for the diamond earrings giveaway was randomly chosen… congratulations to Laura Kathryn Cardamone!! Previous Post My Picks from the Saks Friends and Family Sale! So beautiful!!!! 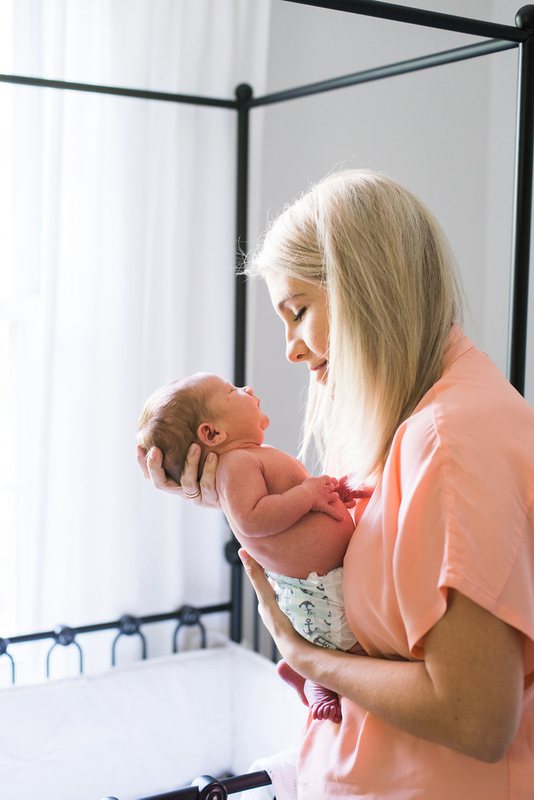 Would you mind sharing where you got the small lamp on the dresser/ changing table? I need a small lamp for our little ones room and that's exactly what I was looking for! LOVE this! It turned out so perfectly and Watson is adorable! Can I ask where you got the basket that he is laying in? 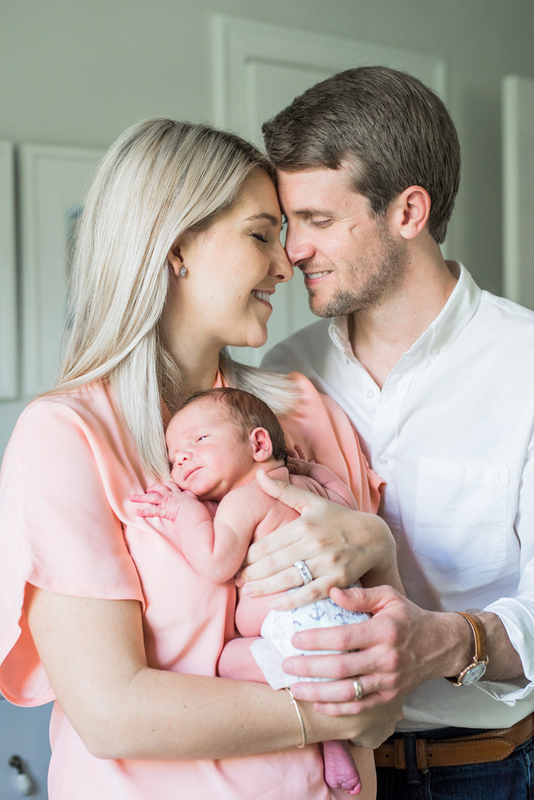 We are having a baby girl in June and I'd love to pick that up for her newborn photos! Can't wait for the rest of your baby posts! Perfection ! He is adorable and that room is perfect ! What a sweet little room! It is perfect! And so is he! What a sweet room! Can you share the paint color? It's exactly what I was thinking for our nursery! What are the paint colors you used for this room? So beautiful! Would you also mind sharing about his monogram shoes? I have a 5 month old little guy that I would love to see in them! I love the beach baby sign! 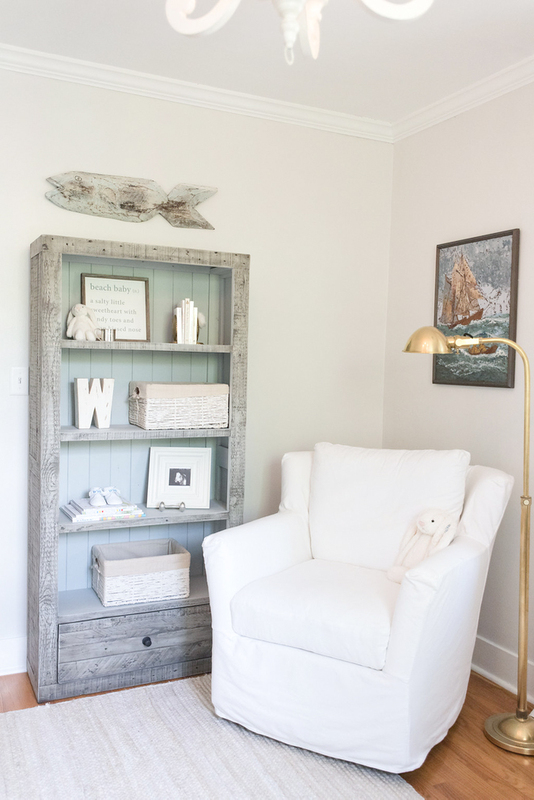 It's exactly the vibe I'm channeling for our baby's coastal nursery. Congrats! Hi Megan! Can you share where you got the plant in your nursery? I also live in Charleston and looked at Lowes and couldn't find anything similar. Is it a banana plant? Thanks in advance! Hi Megan! 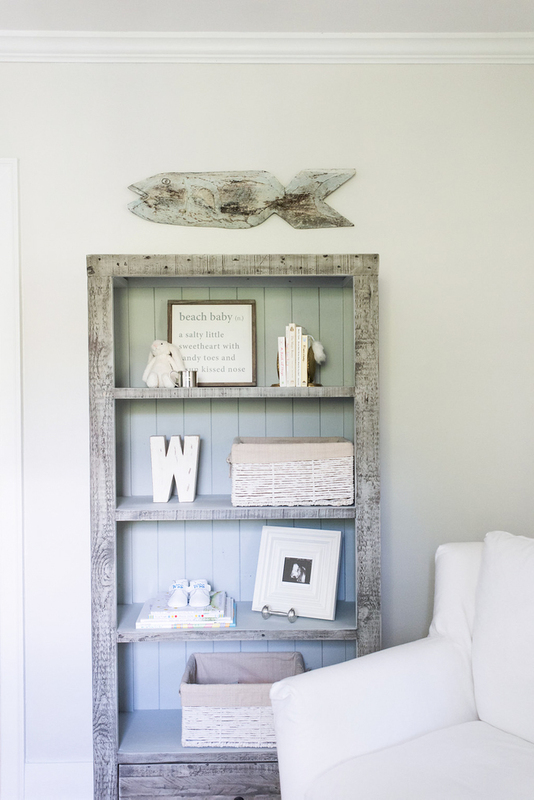 I have the same bookshelf from Celadon and want to use it in my baby boy's nursery as well. Mine doesn't have that baby blue background and seems a little more gray. Can you tell me if you painted yours or did you buy it that way? I love the look of yours and may try my hand at painting! Hi Megan! 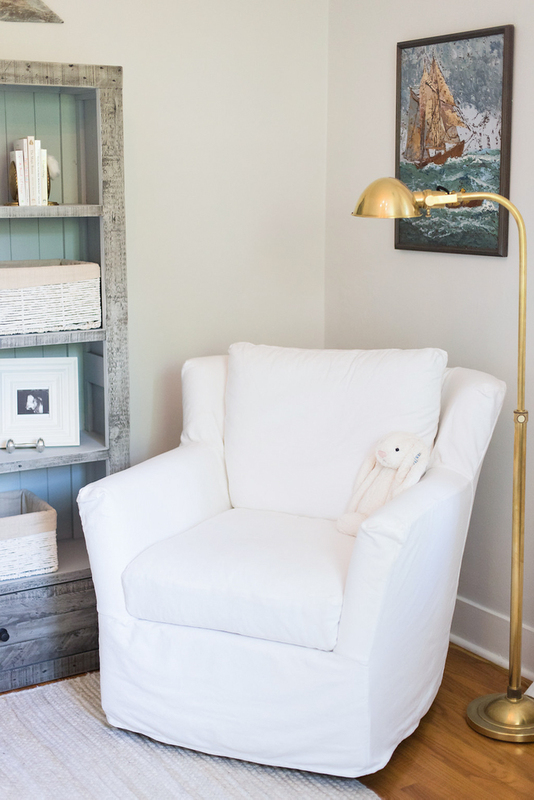 Can you please share the paint color you used for his room? I love it! Oh, thank you so much! Please disregard the note below about paint:) I so appreciate it! Hi Megan! 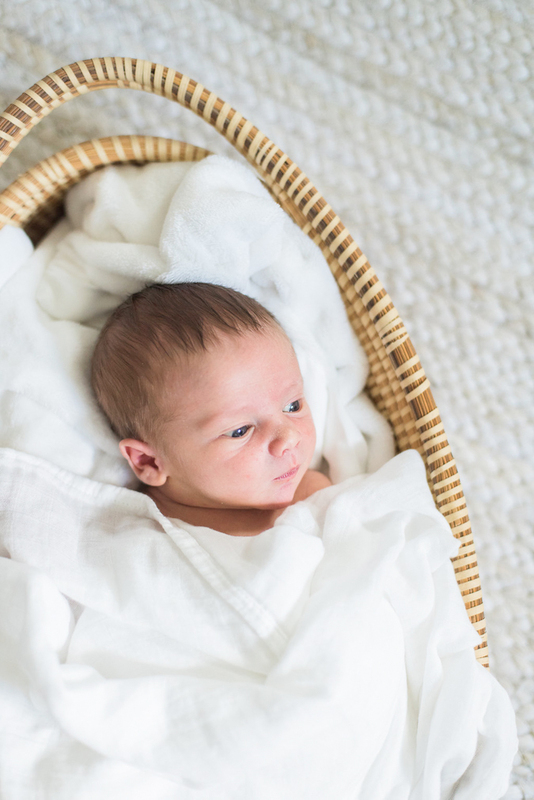 His nursery is beautiful! Can you please share the link to his bedding (it was linking to the chandelier) and also share the paint color used for his room? Thank you! We are due with our first baby boy in mid-July! So excited to meet him! I fixed it all! Glad you saw where I wrote back about the paint color formula. I added that link to the details list too! Please please please tell me where you got that gorgeous corner plant!! !